These are the most used Apps to Communicate with People in other Countries. Skype is a prime video chatting source, although it hasn’t saturated the market. It has an impressive user base of 300 million people and is used for video contact. Its also allows you to call landline numbers at reduced prices (some as low at 89 cents month). other apps here, this app doesn’t allow you to video chat, therefore having the smallest population of users. With only 200 million users, you may not be able to find a lot of your friends using it. audio message all of your friends. Facebook acquired this app in little more than two years ago in a deal valued at $19 billion. It’s available on almost any smartphone platform. Also with this app, you use your actual phone number as a part of your login, ensuring quick verification for your account. 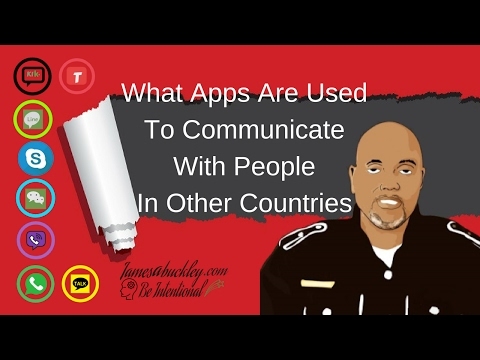 It’s really popular abroad than it is in the United States, and is slowly surfacing, which means you may have to ask your friends and family to download this app specifically to talk to you. What differentiate Tango from other apps is its emphasis on finding everyone else who is using Tango. how far way they live from you. somewhere in the middle of the pack. It also has features such as music and games which lets you find other ways to use this app for amusement to pass the time. Viber has persist to become the 4th largest consumer base among these eight apps. It has a estimated 360 millions users. It’s easy to use, with a surprisingly uncluttered setup, and similar to WhatsApp, you use your phone number to register. It has free video chatting in the package. You can also use the many stickers, if you are in to that. feature released two years ago. KakaoTalk doesn’t have a huge user base although, it’s listed because of its massive usage in the South Korean market. If you’re not reaching abroad in South Korea don’t bother, but if you are, you want this app. you can use stickers in your messages. In 2014, LINE released there states sharing that its top registered consumer base by country, with Japan. They also stated that they was at the time leading with 54 million registered users. LINE also lets you see a selection of your favorite artists, with special discounts. They also accredited to an impressive count of 10,000 stickers on its homepage. Last but not least when calling the United States, they’ve got a flat-rate landline charge of two cents per minute. Although a source stated 438 million people, according to the company. It is the go-to app for many going to school abroad in China, but its range extends far beyond its home country’s borders. In 2013, it was the most-downloaded messaging app in 10 countries including Argentina, Italy, South Africa, and Turkey. that lets you know who else is shaking their phone. use Facebook messenger on a monthly average is 11%. The average number of photos sent through Facebook Messenger per month is a staggering 17 billion. Their are a reported 200 countries that are using chatbots in Facebook Messenger. Facebook Messenger’s has 300 million users that use audio and video calling features each month. The average number of messages sent monthly between users and businesses on Facebook Messenger is 1 Billion. Voice Over Internet Protocol on a global bases state that globally there are 10% placed on Facebook messenger. not to mention the 22 million GIFs sent daily.